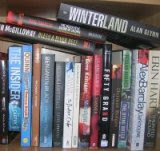 Here are all my book reviews listed alphabetically by author. I also have them organized by year read, country of setting, and a separate listing for Irish authors and books set between 1930s and 50s. Codebreakers by James Wyllie and Michael McKinley ***.